The New York Times article, A Faded Piece of Papyrus Refers to Jesus’ Wife, has sparked an interesting outpouring of response in the [Christian] blogosphere. What is most enlightening, and sadly also most expected, is the dismissive, adamant, hard-line, out-of-touch, snarky response of Christians! An opportunity for discussion and enlightenment is shut down without seeing the possibilities an article like this presents. Ugh! 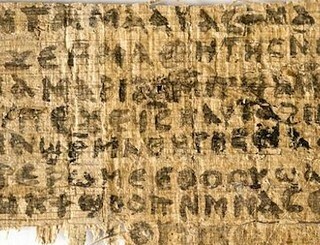 The article describes a Coptic papyrus fragment from the 4th century that contains the phrase: Jesus said to them, ‘My wife …’. That phrase alone is what has everyone up in arms and is resurrecting theological terms, like Gnostics and canon. Fiction (e.g., Dan Brown’s The DaVinci Code) and non-fiction books (e.g., Elaine Pagels’ The Gnostic Gospels) are mentioned because they fall under this gnostic umbrella and reside outside the realm of some Christian doctrine. Of course, I have my theological and doctrinal opinions, but that’s not the point. I’m bold enough to say that most church-going Christians don’t even know what gnosticism is or how the canon of Scripture was established or the theological basis and import of what glibly rolls out of their mouth. And if they don’t know, the regular person surely doesn’t know … and doesn’t care! The regular person, and many who consider themselves Christian or who go to church and read the bible, has a mixture of thoughts from a variety of sources and experiences from which they distill a working belief system that makes sense to them. They don’t dwell in a black-and-white doctrinal world. They don’t think about the theological implications of if-this-then-that. Heck, I’ve had churches full of these regular people! The opportunity that an article like this presents is a chance to dialogue about the subject matter! When someone asks me what I think about an article like this, they’re not interested in my theological exposition of the topic. They’re curious. It’s an opening to talk about something spiritual they might not even be able to articulate themselves. It’s a place to start a spiritual conservation, usually leading to something spiritual that has nothing to do with the original topic! A dear parishioner friend of mine read The DaVinci Code and gave it to me to read when I had my ankle replacement surgery. Thank God I had such an entertaining book to read during my hospital stay. I needed something to help distract me in the absence of pain medication. When I got home and he came to visit, he asked me what I thought of the book. I learned many years ago that often the initial questions aren’t necessarily the real questions. Sure enough, after I gave my general, non-opinion answer, I asked him what struck him in the story. That’s when we started peeling back the layers of questions and thoughts and wonderings about Jesus that emerged for him as a result of the story. That was the beginning of an ongoing dialogue we had for the rest of his life! Articles and topics like this raise all kinds of questions. Yes, there are theological and doctrinal issues at stake that have their place in seminaries and classrooms and intellectual discussions for those who have some working knowledge of the subject matter. But for the rest of the population, why not use it as a conversation starter to learn more about what someone thinks, what they believe, how they develop their spiritual understanding of things, what questions do they really have. Cultivate an open, non-judgmental environment that is receptive to doubt and uncertainty and, yes, even beliefs that are different than yours. I was waiting to hear your Eternal Schemes on this subject. Well done!